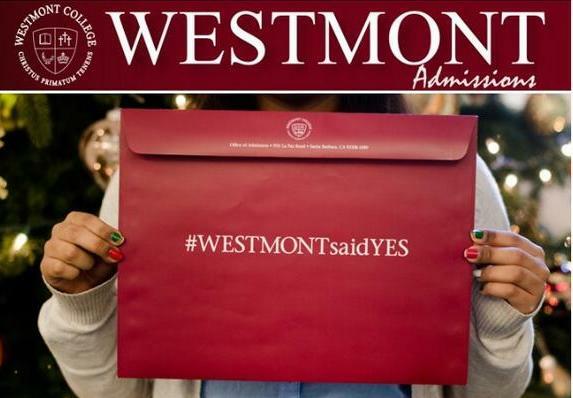 Over the past few months my alma mater, Westmont College, sent out a few hundred #WESTMONTsaidYES packets to some very excited college applicants. Shortly thereafter, Twitter lit up with, “I just got accepted into my dream school!” and “California here I come!” tweets. With tuition and room and board hovering around $50K, I’m glad my kids and I are done with college. But I’m super excited for those who can hardly wait to move into the dorms next fall on Westmont’s gorgeous campus that tricks you into thinking you’re on vacation at a resort. Well, for the first week at least. Then once classes start, you’re hit with the reality of all the academic work that’s ahead of you. And a journey begins that will change the course of your life. It did mine. In college I sorted out my career path, dated my future wife, learned how to study, started eating salad, did what I wanted to do when I wanted to do it, washed laundry as infrequently as possible, found a way to live with a roommate without freaking out, failed French, found out I didn’t like Chinese food, faced my share of moral choices, hung out in the library more than any other time in life…well you get the idea. It was a time to find myself. And to reinvent myself. Will you, or your son or daughter, be ready for all of that and more…? No one is ever completely ready for what’s ahead. It’s just a part of life that we don’t exactly know what’s coming or how we’ll handle it all. We can plan and pray, but the future is a variable that we can’t completely control. But students can be better prepared for life on their own if they make the most of the time they have right now before they head out into the world. Here’s one thing* you can do now that will make things easier when you begin life out on your own – determine what your convictions are. A conviction, according to Google, is a “firmly held belief or opinion.” From a biblical perspective, Howard Hendricks once said, “A belief is something you will argue about. A conviction is something you will die for!” Preferences will change over time. Convictions won’t. Do you have any? You should. Before you head out into the world to be faced with a bezillion decisions about what you’ll do and say and see, think about the convictions you have. Where will you draw the line in what is right and wrong for you? Remember the story (it’s true, BTW) of Daniel in the lion’s den? I’m sure he didn’t want to end up face to face with a lion. But he got to that place because he refused to waver in his convictions. Which isn’t very good PR for hanging on to convictions… until you get to the end of the story. If he had given in, he wouldn’t have seen God deliver him miraculously from that lion. And because he went through all of that, the course of his life was changed, in really good ways, forever. That’s just the kind of thing God is waiting to do in the life of someone who hangs onto their convictions no matter what. Got any? *For more tips on ways to be prepared for life on your own, check out Just One More Thing…Before You Leave Home.